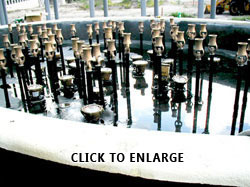 Your fountains deserve our trained staff to keep them operating at peek performance. Our years of expertise in the design, equipment supply, and construction of fountains, makes us the most experience team to keep your water feature running the way its meant to. Weekly fountain maintenance is the key to keeping your expensive fountain not only beautiful and clean, but running properly as well. The idea that as long as the water looks clear its OK is a common misconception with fountains. We see too many pool main companies just dumping tons of chemicals in these fountains without the worry about proper balancing. Our fountain is not for swimming in but the PH level and Chlorine levels are needed to be kept in check for your fountains sake. The finishes in the fountain rely on balanced water chemistry to last for many years, without repair. The equipment for your water fountain is not cheap, and it requires a consistent water balance as well. Most of your equipment requires proper water balance for your warranties to remain in effect. We have many Florida maintenance locations, contact us for one of our maintenance officers near you. Our job is making you look good. Prevent the development of dangerous disease-causing pathogens, including bacteria. Protect fountains from damage. Help people avoid skin or eye irritations and, Control the pH, the total Alkalinity and the calcium hardness levels of Fountain pools. 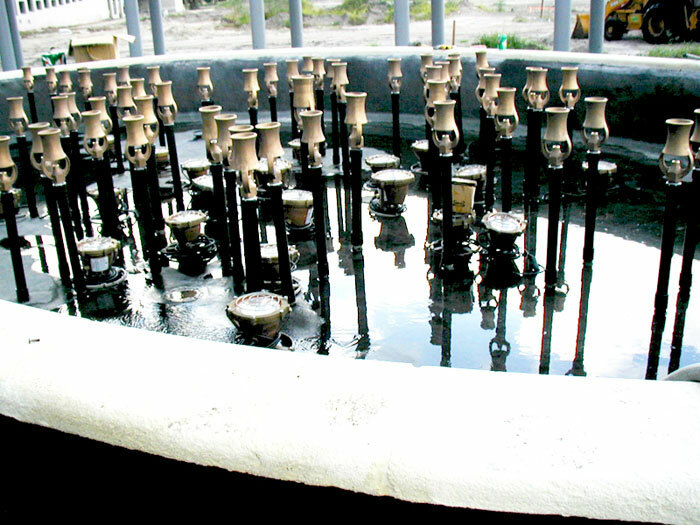 Adding sanitizer to your fountain to kill harmful pathogens. Most people use chlorine to perform this task. As a disinfecting agent for swimming pools, comes in two basic forms: the solid form, calcium hypochlorite, or the liquid form, sodium hypochlorite. Alternative pool sanitizers work in a similar way and include the non-halogen class of sanitizers known as biguanides and bromide, which works better in hotter temperatures. When you perform fountain maintenance, you should only use one type of sanitizer to avoid fountain problems such as discolored water. While chlorine can kill bacteria, it often becomes unstable in the water. This can occur when UV rays penetrate the water. Chlorine can also combine with other pool chemicals to create new compounds that will negatively affect the water in fountains. Many sanitizers come with pool stabilizing agents included, but you may need to add a stabilizer like cyanuric acid. You may need to add a pool shock agent to the water when chlorine or other sanitizers combine with ammonia or nitrogen compounds and create chloramines. When this occurs, the sanitizer loses its ability to kill pathogens. You can use a high dose of chlorine, designed to raise the chlorine level up to 10 times its current level; a non-chlorine shock, such as monopersulfate-based oxidizers; or other alternatives like lithium hypochlorite. Algae does more than turn fountains green! The bacteria can make the walls and floor of a fountain slippery, increasing the risk of an injury related to a fall. While sanitizers help reduce the buildup of algae, you may need to add a pool algaecide as part of your pool maintenance routine. The most popular and least expensive algaecide falls under the Quat category, which uses surfactants to prevent algae development. Polyquats can work on a variety of algae, including yellow or black variations, and are a better option for people who are trying to clear up an algae infestation. Other alternatives, such as copper salts, are available; however, they can stain fountains over time. Sparkling clear water doesn't happen overnight, but cloudy or hazy water can. Pool water clarifiers are pool chemicals that you can add to improve clarity. Many work by bonding to debris particles, making them easier to see. The increased size allows you to use pool tools, like skimmers, to remove the debris from the pool. Most water clarifiers will not affect a pool's pH level or other chemical balance levels. Sometimes the preventive measures you take during your fountain maintenance routine will lead to unsightly stains on your fountain. You may find it necessary to use pool stain removers to restore your pool to its original condition. When you shop for pool chemicals, look for ones that will work on the type of surface you have. With the pebble pool finish, you may want to acid wash it to remove stains, use a 50/50 mix muratic acid to water, wash and rinse. This should be done by someone who has experience with doing this. You can also use stain products to help prevent the development of discoloration.